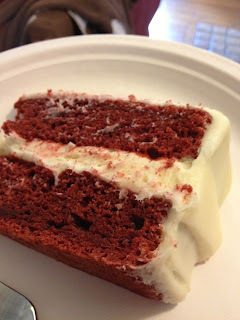 My friend Krystal loves red velvet cake. I think I've made at least four at her request over the past couple of years. Krystal recently found out she needed to start eating gluten-free. Of course, I've shared lots of tips and recipes with her. 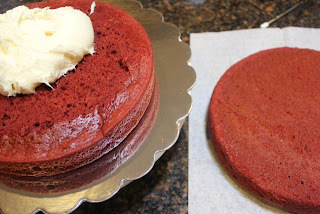 When her youngest son's first birthday was fast approaching, she asked me to make a cake... you guessed it... red velvet - but this time it had to be gluten-free. She certainly wasn't disappointed with the result. None of her family or friends seemed to notice the cake was gluten-free either! I call it a success. *Pamela's is my favorite. But you can use any gluten-free vanilla cake mix. Or if you don't need your cake gluten-free, you can just use any vanilla or white cake mix. Preheat your oven to 325 degrees. Spray two 8 inch round pans (or 9 inch round pans) with non-stick cooking spray. You could also use this batter for cupcakes. Simply line a cupcake pan with paper liners. Mix all ingredients in a large bowl using an electric mixer until just combined. Divide the batter between the two prepared round pans (or between 18 cupcakes). Bake for 26-30 minutes or until a toothpick inserted into the center of the cake comes out clean (18 minutes for the cupcakes). Allow the cake or cupcakes to cool completely. In the bowl of a stand mixer (or using a hand-held electric mixer), cream together the butter and cream cheese until smooth. Add the vanilla extract and powdered sugar. Mix on low (be sure you use the lowest setting or powdered sugar will fly everywhere!) until the sugar is incorporated and the frosting is creamy. Place one of the cakes on a cake plate. 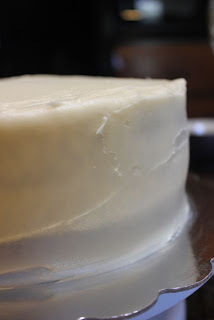 Level the top of the cake using a serrated knife if needed. 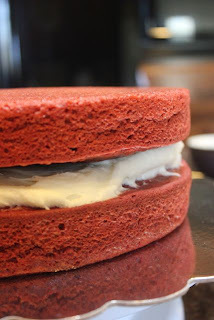 Add enough of the frosting to make about a 1/2 inch to 3/4 inch layer of filling. Level the second cake if needed. Place the second cake upside down (so the flat bottom faces up) on top of the filling. 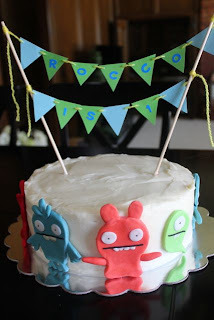 Spread remaining frosting on sides and top of the cake. If you are making cupcakes, simply frost the cupcakes with the cream cheese frosting using a knife or spatula. Store cake in the refrigerator. Enjoy!!! Can you taste the mayonnaise?